Milk has long been a staple food source for many of the world's inhabitants. Though milk has been produced through much of mankind's history only recently in the age of industrialization has the quality of milk been questioned. Industrial milk farms have increased production making it affordable to many, yet some believe crowded cattle, antibiotic usage and the use of corn as a food source have made the healthiness of the milk suspect. In response, many smaller farms began to offer "Organic" milk using free range grass fed cattle. In this experiment Scientific AmeriKen will investigate if differences in regular and organic milk can be seen on the biochemical level. According to the product labels regular and organic milk are identical - Both contain 9 grams of protein per serving and nearly all other statistical information between the two are identical. In spite of this label information Scientific AmeriKen believes there must be some difference to justify the extra cost of organic milk. It is the hypothesis of this experiment that differences will be seen! Centrifugation: Both regular and organic non-fat milk was purchased and samples were centrifuged at high speed (30,000 x gravity) for 30 minutes (figure 1). All further experiments were carried out using the supernatant. 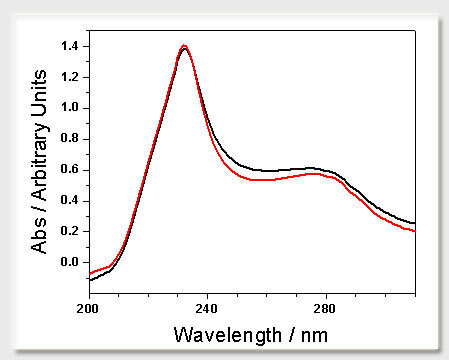 U/V Spectra Analysis: Each Sample was diluted to 1/80th of its initial concentration and the absorption of light (predominantly in the Ultra-Violet region) was measured between the wavelengths of 200-310 nanometers. Experiments were done on a Jasco Spectrophotometer. 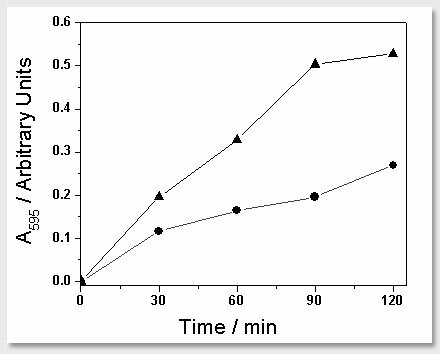 SDS-Page Analysis: Samples were prepared by first mixing in a 1:1 ratio with a loading dye (containing a dye and glycerol to make it sink in water) and then running 5 microliters of each sample in a 12% polyacrylamide gel at 120 Volts for 60 minutes. During SDS-PAGE analysis, SDS a detergent coats the proteins in negative charge that gets pulled downward through the gel by the voltage. The gel is a thick matrix that slows the proteins allowing a separation of larger proteins from smaller. Additionally, samples were digested with 0.5 milligrams per milliliter of Porcupine pepsin at a pH of 1.8 (reached by adding a calculated amount of HCL to milk - contribution from milk to final pH is not known). This was done to simulate digestion. Bacterial Growth Curves: 5 milliliters of each regular and organic milk were placed into a 15-ml test tube. Each were then inoculated with 200 microliters of Ampicillin resistant e. coli bacteria. At each half hour time point, 250 microliters was removed and used to measure its ability to scatter light at 595 nanometers. Measurement at this wavelength of light corresponds to the growth of the bacteria. The values at time 0 were also taken and were subtracted from all subsequent measurements. Initially each milk was sampled for flavor. Surprisingly the more expensive organic milk had a very slight foul taste though it was well inside of the expiration date. It should be noted that milk is not a prefered drink of Scientific Ameriken. Scientific AmeriKen passed each milk sample through U/V analysis to globally assess potential differences (fig 2). The area of interest in this experiment is around 280 nanometers - a region where ultra violet light is typically absorbed by proteins. Although the milk labels claim that both contain a protein concentration of 37.5 milligrams per milliliter of milk, the absorbance spectra differ. One possible explanation could be a different types of proteins found between the two milks. To confirm that the difference in the UV spectra were due to differences in protein composition, both organic and regular milk were analyzed using SDS-Page Analysis (fig 3). 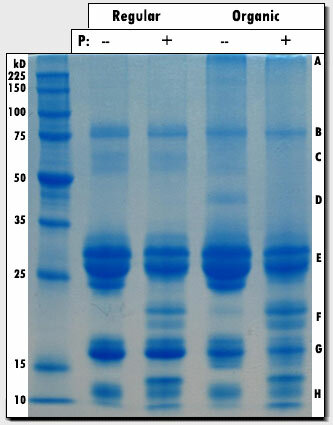 Major milk proteins appeared to be at similar levels in the two milks (as judged by the size and intensity of the bands) however in contrast the organic milk appeared to have two unique protein species (fig 3 - bands A & D) that were not found in the regular milk. The identity of these protein species is unknown. The digestion pattern of both regular and organic milk by pepsin was similar but it is noted that even after 30 minutes complete digestion did not occur. 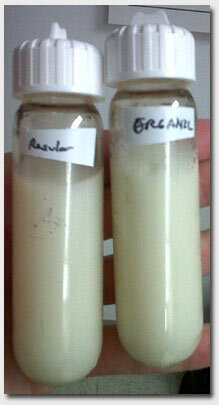 To test if the differences between regular and organic milk can be noticed by a life form, samples of each were inoculated with an antibiotic resistant e. coli bacterial strain (fig 4). The data clearly show that bacteria growing in the organic milk grow at a much faster rate - as much as 2.5 times more growth as seen after 90 minutes. Scientific AmeriKen is a bit surprised at the differences found through the experimentation, in particular the rapid growth of the bacteria in organic milk as opposed to regular. Though it is suspected that these bacteria will grow only in the best of milk, another possiblity is the presence of antibiotics in regular milk coming from antibiotics fed to the cattle and then passed into the milk. It should be noted that the resistance the bacteria have only protect it from one type of antibiotic. Though there are kits to test for the presence of antibiotics in milk (link), Scientific AmeriKen also acknowledges that this experiment was carried out only one time (as golf sounded more appealing than watching e. coli grow for two hours) and science only builds its strength through repetition! Scientific AmeriKen also investigated the ability to digest milk for the larger question of whether any active proteins survive our digestive system. Even after 30 minutes of pepsin digestion most of the milk proteins survived (in particular lactoferrin - perhaps a good thing?) - but our digestive systems still contain many other enzymes and someday, for the sake of fun science, Scientific AmeriKen hopes to recreate this process. What was also of interest was the presence of the two unique bands (fig 3, A & D) found in organic milk that were not found in regular milk. Though it is not certain whether these are different proteins or variants of the normal proteins - what is known is this is what you get with the extra money for organic milk and undoubtedly where the good health comes from! Figure 1: High speed centrifuge bottles containing regular and organic milk. Figure 2: U/V analysis of regular (red) and organic (black) milk. Proteins measured at 1/80th of their initial concentrations. Figure 3: SDS-PAGE analysis of regular and organic milk in the absence (-) and presence (+) of pepsin. First lane contains protein size markers for reference. Identified proteins include: Lactoferrin (B), Serum albumin (C), Casein proteins (E), Beta-lactoglobulin (G), alpha-lactalbumin (H), degradation products (F,G,H) (source). Figure 4: Growth assay observing the growth of e. coli in organic (triangles) and regular (circles) milk. Equal amounts of bacteria were mixed with 5 milliliters of each type of milk. The mixtures were then grown at 37 degrees Celsius and shaken at 150 rpm. Samples were extracted every half hour. Discuss these results and more at ScienceChatForum.com!